Since the Great East Japan Earthquake there has been much interest from people in the UK wishing to volunteer in the affected regions of Japan. InsideJapan Tours and Into Japan Specialist Tours are two particular organisations which are helping people from the UK to do so. Below is an introduction to the work that they have been doing and information on how you can get involved. InsideJapan Tours have raised over £25,000 for their chosen charity, Civic Force, who have been heavily involved in relief efforts in the Tohoku region since 11th March, but they are keen to offer customers other channels to help the people affected by the tsunami. Ruth Hubbard, the company's Sustainable Tourism officer said, "We have recently begun working in collaboration with an organisation called United Planet, who specialise in arranging volunteer work. In Tohoku, United Planet are concentrating especially on emotional support through teaching at schools and kindergartens, visiting and supporting those in temporary accommodation or taking part in community cultural activities. Volunteers typically stay at family homes, thereby further facilitating cultural exchange." Co-Director Alastair Donnelly recently visited the Tohoku region and met with United Planet in Sendai. He said, "This is an exciting opportunity for InsideJapan Tours as we can be sure that we are offering our customers a safe and reliable volunteer programme for years to come, if necessary. It has been a hard year for Japan and an emotional one for us, but we are delighted to see that customers and general travellers have been inspired to volunteer to help the people of Tohoku and Japan. We hope that, as word gets out, people will continue enjoying their travels to this stunning country and that more people will be inspired to volunteer in this rural region wanting to do their bit to help the wonderful people of Japan." InsideJapan Tours also continue to offer their Tohoku Small Group Tour, 'A Northern Soul'. The tour includes a two night stay in Sendai as well as time in the newly designated World Heritage destination of Hiraizumi. Alastair Donnelly said, "We have operated this tour for eight years now and were delighted to have 10 clients take this tour in October 2011. We have three departures in 2012. By visiting and staying in Tohoku, foreign tourists can make a real economic difference to the affected areas." For more information about volunteering through United Planet or visiting Tohoku on a small group tour visit InsideJapan Tours or email InsideJapan Tours on info@insidejapantours.com. Into Japan Specialist Tours is supporting the work of three international volunteer groups operating in northern Japan, via the UK-based charity Helping Hands for Japan. Into Japan staff have participated in volunteer work and are happy to offer free up-to-date advice to anyone who wishes to do volunteer work. They are also happy to make travel arrangements on a non-profit basis for anyone wishing to spend at least five days as a volunteer. 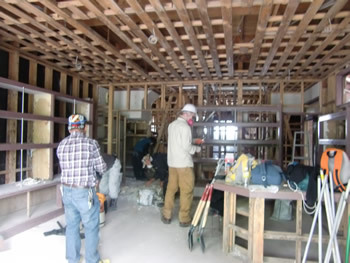 Expenses are extremely low for volunteers while working with any of these groups; It's Not Just Mud are based in Ishinomaki and welcome volunteers staying for two days or more. Volunteers stay in two houses lent by the owners, which suffered extreme tsunami damage and have now been restored to a reasonable condition. Their current projects include restoring other houses, helping businesses to re-open, making furniture for evacuees and a project to build playgrounds near temporary housing. Ishinomaki was the worst affected town in terms of numbers. Save Minamisoma make regular 24 hour trips (overnight one-way) from Tokyo at weekends to Minamisoma delivering supplies and supporting events at temporary housing. 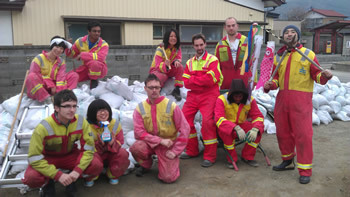 Team Heal Japan have day-trips by coach from Tokyo at weekends mainly to Iwaki, assisting continuing clear-up operations. David Lee, the director of Into Japan, has been to Tohoku four times since the March earthquake working with various volunteer groups, and stresses that there is a huge continuing need for volunteers. No Japanese ability or special skills are required. Good health and a friendly personality are the only requirements. Medical cover for up to one year covering any health issues related to volunteer work is provided locally.